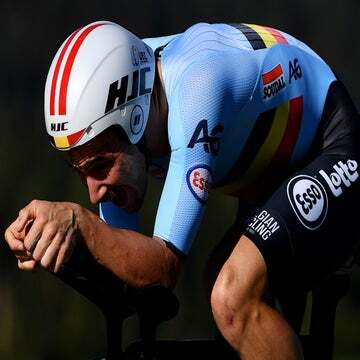 MILAN (VN) — Bradley Wiggins has scheduled his next target, the hour record. After racing Paris-Roubaix on Sunday, the Englishman will attempt to break the 52.491-kilometer mark June 7 in London’s Olympic velodrome. Team Wiggins, the new Continental team the 34-year-old cyclist formed, announced the date on Twitter Wednesday. It did not give a time, but said that tickets will be available for purchase starting Friday. Wiggins began the team as a way to transition from top-level road racing to the track. He helped debut Sky in the professional peloton in 2010 and raced with the team over the last five years, a period that includes his 2012 Tour de France victory and his gold medal at the 2014 world championships time trial. His last race in Sky’s black and blue colors was Paris-Roubaix. He is now aiming for the hour record and for another team pursuit gold medal at the 2016 Olympics. In the build-up, he will race with team Wiggins in a series of smaller races. Some of the members of the 10-man team raced in the Under-23 Ronde van Vlaanderen (Tour of Flanders) last Sunday. Wiggins will join the team for the Tour of Yorkshire, May 1-3 — his first appointment with the team and his last before the hour record. Australian Rohan Dennis (BMC Racing) holds the record now at 52.491km. Since his ride on February 8, Dutchman Thomas Dekker and Swede Gustav Larsson tried to top the mark but came up short. Wiggins appears to be aiming for a mark in the high 53km to 54km range, to top those of Spaniard Miguel Indurain and Swiss Tony Rominger. In 1994, Indurain went 53.040 and Rominger rode 53.832 and 55.291. After Brit Chris Boardman set the bar at 56.375km, cycling’s governing body changed the rules to stop an arms race, and to require standard triangle frames and box rims. In May 2014, the UCI changed the rules again to allow pursuit-style track bikes. 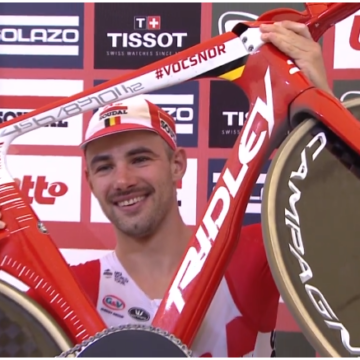 “There has been a resurgence [in the hour record]. People like Rapha are wetting themselves over it because they can do a T-shirt,” Wiggins said two weeks ago in a small chat with 10 journalists. “It’s great because it’s another celebration of this incredible record that lay dormant for 20 years because Chris Boardman ruined it for everyone with his stupid bike. Wiggins has won one team pursuit and two individual pursuit gold Olympic gold medals. On the road, he won the 2012 Olympic time trial. In the meantime, Englishman Alex Dowsett (Movistar) will try to break the hour record May 2 in Manchester, England. He was due to attempt it February 27, but a crash and a broken collarbone delayed him. Afterward, the attention turns to Wiggins.